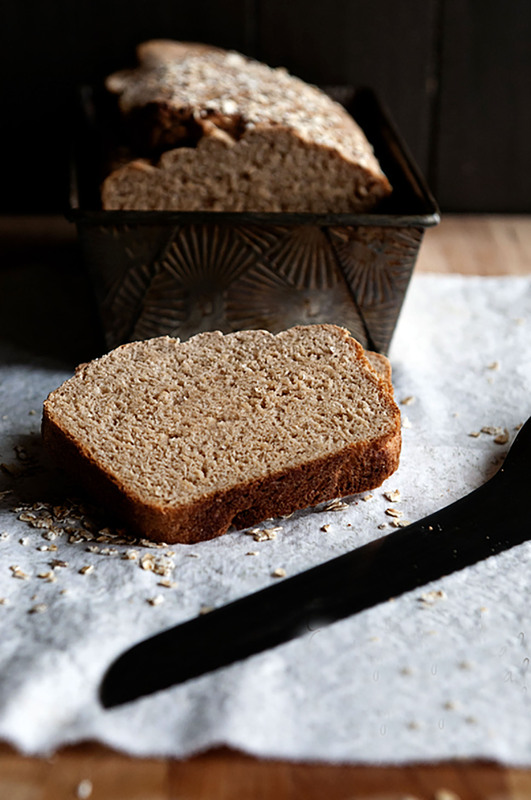 A hearty, delicious bread recipe that is perfect served as toast or with your favorite sandwich fixings. In large bowl combine Active Dry Yeast, water (heated to 110-115°F) and sugar; let stand 10 minutes. Stir in butter, milk (heated to 110-115°F), salt, oats and all-purpose flour; beat until smooth. Mix in enough remaining whole wheat flour to make dough easy to handle. On lightly floured surface, turn out dough; knead until dough is smooth, elastic, about 10 minutes. Place dough in greased bowl. Cover; let rise in warm place until almost doubled in bulk, about 1 hour. Grease two 9x5x2-inch pans; set aside. Punch down dough and turn out on lightly floured surface. Cover and let rest 10 minutes. Shape into loaves. Place in prepared pans. Cover and let rise until doubled in bulk, about 45 minutes. Brush the loaf lightly with water and sprinkle with water and sprinkle oats over top. Preheat oven to 425°F. Bake loaves 25 to 30 minutes, until lightly browned and bread sounds hollow when tapped. Remove from pans to wire rack to cool. This recipe is featured at Dine & Dish. A great basic recipe! The mix of white and whole wheat flour keeps it from being too dense and “healthy” tasting, but it really is wholesome. I even used all purpose flour instead of bread flour, and it turned out just fine. I’d make this again.